Children love to play with dolls, but they often wish their dolls could really do some of the things they see little siblings do. While the strength of a child’s imagination can make any doll come alive, adding a bit of realism is usually a big hit. 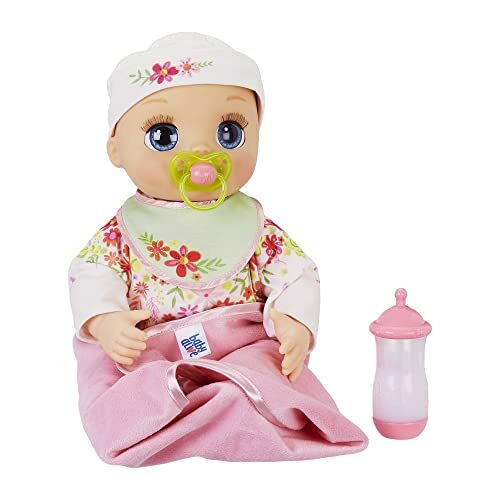 Baby Alive dolls are a classic example of a realistic baby doll. At this point, there are so many versions of Baby Alive that you could find just about anything you want for any age range of child. This list covers a range of Baby Alive dolls that do a variety of things so that you can find exactly what your child is looking for. Let’s take a look. What Actions Are Most Important? What Accessories Do You Want? Why Should My Child Have A Realistic Doll? The dolls are divided based on realism features, making it easy to distinguish between dolls that make noise and dolls that make a mess, for example. If you’d love for a doll to talk and laugh but don’t care for one that goes potty, this list has you covered. Caring for potty dolls can be an excellent way for kids to learn to go potty on their own and then continue to care for a doll after that period is over, but be prepared for some mess at some point. Baby Alive Potty Dance Baby is a realistic potty training doll that really pees in the potty after you feed her water from her bottle. She comes in a variety of hair colors and skin tones and has two different language options for all her fun phrases. You can even choose how she refers to your child with a «mommy» and «daddy» setting. She comes with an outfit with underwear, a simple potty accessory made of durable plastic, and her bottle. Your child can comb her hair with the included comb, and she even has a bottle of pretend soap or hand sanitizer, perfect for teaching your child about cleanliness after going to the bathroom. The included sticker chart can mark her progress just like the process you’re using with your child. If your child is beyond the potty training stage, he or she may enjoy changing diapers just like mommy and daddy. The Lil’ Sips baby comes with a bottle and removable diaper. Feed the doll water from her bottle, and she wets the diaper. She comes in a variety of skin tones and hair colors as well. She doesn’t talk or make noise, making her perfect for households that have enough noisy toys. Instead, she’s a quieter option for children who are learning about caregiving just like mommy and daddy. When the bottle is empty, children can play pretend with the diaper, making her an excellent accessory for the type of imaginary play children need to learn about the world around them. 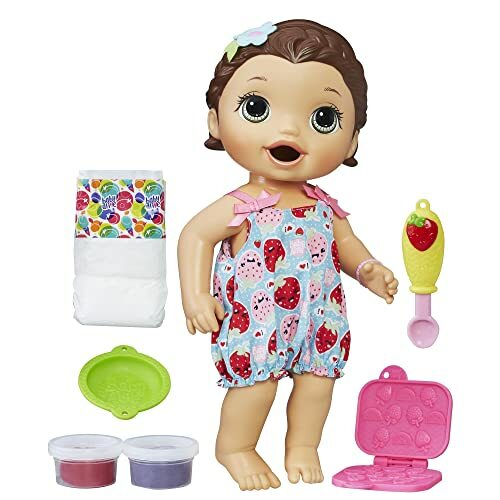 If your child is a little bit older, eating and going potty could be an exciting doll option. These types of dolls can teach children more about cause and effect and can open up dramatic play a bit more. These dolls do require a bit more maturity because of the potential mess involved. 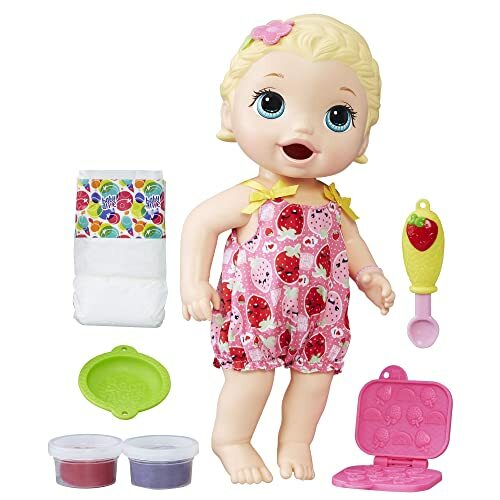 Sweet Spoonfuls dolls come with a sippy cup, a «blender» and diaper accessories. You can mix up baby’s favorite food with water in the hand-operated blender and feed the doll from the spoon and the sippy. When the doll is ready, he or she poops and pees in the diaper. The dolls come in both boy and girl options with a range of hairstyles and skin tones. The food packets are simple to mix up and are easily replaceable when your child runs out. The dolls don’t make noise, so if you wanted to remove the mess, the dolls function well as simple baby doll toys. If the thought of having to buy food packets isn’t a fun idea, this option uses a reusable food option. 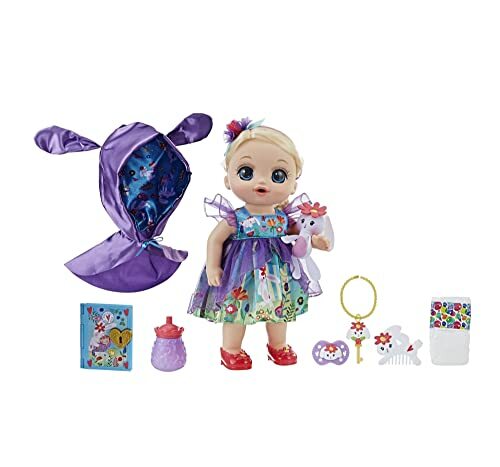 The doll comes with a pretend oven, two packs of jelly-like reusable food, a rolling pin, and a spoon. Your child can feed the doll the treats, and she poops into her diaper (allowing your child to reuse them). She comes with a comb and a diaper that’s easy for little fingers to get on and off. Her hair is soft enough to comb, and she comes in a cute outfit. There are no noises, so no batteries to buy for the doll, but the oven does have a dinging timer feature. This version of Baby Alive also comes with reusable food and a noodle press, allowing your child to make fun noodle shapes to feed the doll. Once she’s fed, she poops into her diaper. She says a variety of fun phrases in two languages and also allows you to choose a «mommy» or «daddy» setting to accommodate your child’s gender. Her diaper is easy to use for little fingers, and once she’s pooped, your child can reuse the noodles again and again. She requires batteries but is an entertaining option for children who can be responsible with the reusable food. So you don’t want something that makes a mess, but you still want your child to have the option of a bit more realism. Talking dolls are great for children who are developing early language skills and can also help build social skills such as empathy. This one is an infant style doll that comes in a variety of skin tones and eye colors. She makes sweet cooing noises and sucking sounds when your child «feeds» her with the bottle. She has over 80 lifelike expressions and sounds, reacting to your child and helping teach empathy as your child cares for her. She wiggles and giggles when tickled, turns her head when your child talks to her, and even naps when rocked. She comes with care accessories like a blanket and pacifier, plus a bottle with disappearing milk. Sweet Tears is an excellent doll for teaching empathy. She comes with several medical accessories for your child to check on her when she isn’t feeling well. She makes crying noises and even cries real tears. As your child cares for her, she’s soothed and stops. She comes in a variety of different skin tones and colors and can speak over 35 phrases in English and Spanish to mommy or daddy. 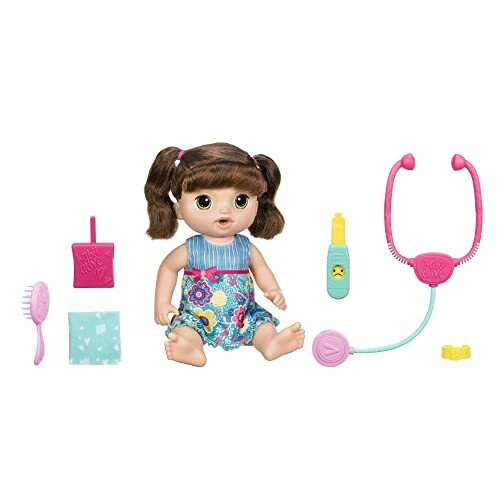 She comes with a stethoscope, thermometer, bandage, juice box, reusable tissue, and a brush. sweet sounds and realistic diaper action. The special edition Baby Alive dolls each come with unique fantasy-themed outfits, an individual story, and a fun personality with lots of sounds. The dolls are designed to teach early social skills and also a love of reading with an illustrated book and a magical key. 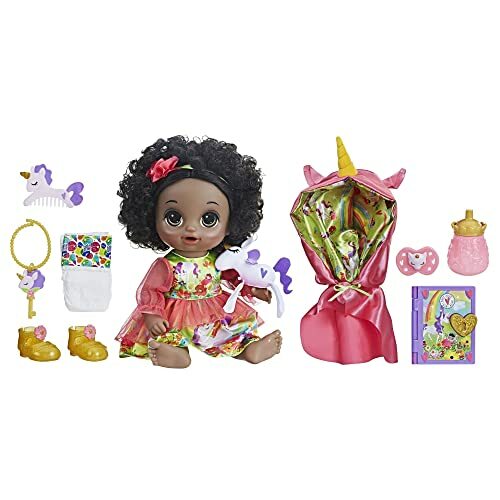 The dolls come with brushes, diapers, bottles, a stuffed animal toy, a book that tells all about each doll’s story, and a necklace with a charm used to unlock her book. She really pees in her diaper when fed water from her bottle and has over 15 sweet sounds when your child interacts with her. Baby Alive has so many different collections of dolls that it can be difficult to know which is the right one. Let’s take a look at a few things you should keep in mind when you make your decision. Young toddlers probably can’t manipulate diapers just yet, so the potential for mess and frustration is high for dolls that go potty. Instead, dolls that talk or have realistic facial expressions can help your child develop early social and linguistic skills without having the frustration of trying to clean up a mess or remove a diaper. Older, potty training toddlers could benefit from having potty dolls because they help establish a routine and teach your child what to expect from potty training. Some people are uncomfortable with children watching them go to the bathroom, so a doll is an excellent way to demonstrate what happens without embarrassing a sibling or older family member. Older children are able to handle the mess and manipulate the accessories without getting frustrated, so dolls that do a range of realistic things from talking to going to the bathroom (and feeding more than just water) can be excellent ways to develop critical social skills. Dramatic play is essential at this age and children could be ready to take on the role of mom or dad just like they see in their own families. Not all realistic dolls make a mess. Not all lifelike dolls make a bunch of noise. It’s important to decide what actions are most important to you and go from there. If you hate the thought of having to buy new food packets each time your child plays, you can use reusable food or just water for peeing dolls, for example. If you hate the noise, you can find a doll that doesn’t make any. If you don’t want a mess, dolls that make sounds and facial expressions are good options. If talking annoys you, a doll that just makes baby cooing noises could be a good compromise. There are ways to get around things that annoy you or aren’t convenient without nixing the idea of a realistic doll altogether. 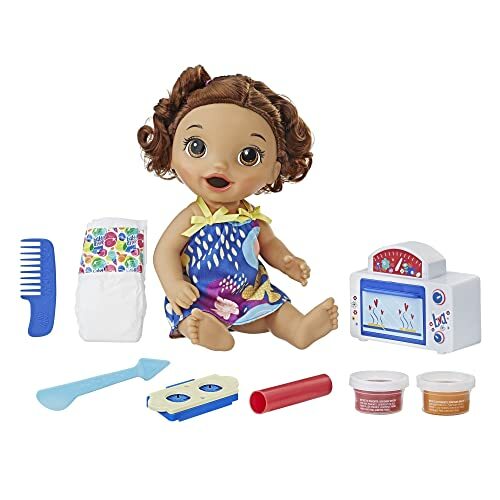 Realistic dolls can be in simple packages (think a diaper and a bottle) or complex sets that encourage full play (the medical kit and feeding tools, for example). The most important part is that your child is able to manipulate the accessories without having to ask you or get frustrated. More complex accessories are excellent for older children who need more complex practice for their fine motor skills. Just manipulating a bottle into a doll’s mouth could be all the fine motor challenges a much younger child needs, but older children can dress dolls, make small amounts of food, and comb hair in ways that allow them to stretch their skills. Dolls can teach children essential skills like social understand and language skills. Dolls that respond to your child’s actions are excellent ways to encourage early language and teach empathy as your child cares for the doll. 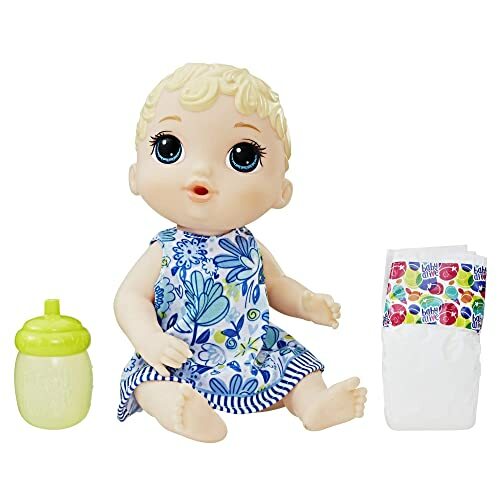 The other aspect of realistic dolls is that children get practice with cause and effect, both in the short term (feeding water causes a wet diaper, for example) and in the long term (taking on the role of caregiver and everything that entails). Dolls that encourage focus and allow children to build on skills as they learn through play is a wonderful way to help children discover their abilities and who they are. A realistic doll could be a gift that catapults your child’s abilities to the next level or just becomes that special toy that your child loves. These Baby Alive dolls can be as simple or complex as you can handle and are an incredible way for kids to build language, social skills, and caregiving understanding. What kid of Baby Alive doll is perfect for your little one? Let us know in the comments below. I’m the mother of two wonderful children. My oldest son John is 7 years old, and my daughter Jemma is a little seven-month-old girl. My kids are the main reason why I decided to start this website. Having been a mother for the last 7 years, I’d like to share some useful tips with anyone who might be interested. Some posts may contain affiliate links. ToyBoxAdvisor.com is a participant in the Amazon Services LLC Associates Program, an affiliate advertising program designed to provide a means for sites to earn advertising fees by advertising and linking to Amazon(.com, .co.uk, .ca etc).